The IB History examination is very keen that students learn to compare and contrast the methods and conditions which led to the rise to power of single party state rulers - sometimes insisting that they are from different parts of the world, and / or that one is a right-wing dictator whilst the other is a left-wing dictator! 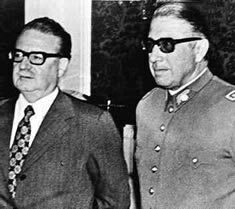 As a result, I follow my detailed treatment of the Rise of Mao in China with a shorter "mini-unit" on Pinochet in Chile. Students then conclude this study by writing an essay on the subject of "Compare and contrast the methods and conditions which led to the rise of Mao and Pinochet". Combined with their studies of the Rise of Franco in Spain and Rise of Stalin in the USSR, this means that students go into the exam equipped with two left-wing dictators (each from a different part of the world) and two right-wing dictators (each from a different part of the world). Students are presented with a series of images from which to draw their own initial deductions. They are then told what each one represents. A good introduction to the topic. Students are given this worksheet framework to help structure their investigation about why Pinochet became leader of Chile. They should use any sources available to them (books, video, websites). 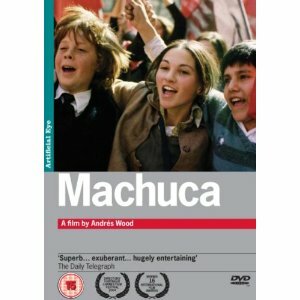 A particularly good video is the 10-minute drama film by Ken Loach which can be found on YouTube. A detailed analysis of the causes for Pinochet's rise to power presented as a "Fill the Blanks" quiz. There is a completed teacher version available. With the research on Pinochet completed, the students now move on to compare and contrast his rise to that of Mao in China. This worksheet provides them with structured guidance on how to go about this process. As a popular format of question in the IB examination, this is a very useful exercise. Students then get into pairs and small groups to compare their approaches to the previous task. There is a lengthy list of "discussion points" provided too in this worksheet designed to get them thinking more (e.g. the USA opposed Mao, but failed to prevent his rise; but they favoured Pinochet, who succeeded. Why the difference?). There are some teacher notes to help with this exercise too. This short study unit should end with students writing an essay on the subject of "Compare and Contrast the Rise to Power of Two Single Party State Rulers" (focusing on Mao and Pinochet). I have written a model essay on this subject myself which is available in the teacher resources area. A model essay by RJ Tarr, ideal for revision purposes. I give students 10 minutes at the start of the lesson to try to complete the quiz. Anyone completing the quiz within the available time gets a score based on the amount of minutes left on the clock. They can then move on to the first lesson task, whatever that happens to be, whilst the other members of the class continue to play. I build up a 'leaderboard' of scores over the numerous lessons we have during revision time to build up momentum! After a study of the 1973 Chilean Coup, and before/during a study of Pinochet's rule of Chile, ask two female students to read out the following dialogue poem to the class as a powerful starter activity. For further ideas about using "Dialogue Poems" in class, follow this link on Tarr's Toolbox: http://www.classtools.net/blog/writing-dialogue-poems-to-compare-and-contrast-viewpoints. "Santiago, capital of Chile during the Marxist government of elected, highly controversial president Salvador Allende. Father McEnroe supports his leftist views by introducing a program at the prestigious "collegio" (Catholic prep school) St. Patrick to allow free admission of some proletarian kids. One of them is Pedro Machuca, slum-raised son of the cleaning lady in Gonzalo Infante's liberal-bourgeois home. Yet the new classmates become buddies, paradoxically protesting together as Gonzalo gets adopted by Pedro's slum family and gang. But the adults spoil that too, not in the least when general Pinochet's coup ousts Allende, and supporters such as McEnroe" (from imdb.com).